Our daughter Audrey, nearly 5, had seen a commercial on the Disney channel in which a family gave their daughter a “kinder-moon” trip. Seriously, she made me watch the commercial. Like a honeymoon or babymoon, Disney is capitalizing on this time just before a child heads off to kindergarten. For years we’ve told Audrey that “mommy & daddy aren’t allowed at Disney.” This is how we were able to send her with my sister and her cousins to Disney World in Orlando. We’ve high fived ourselves for being able to scapegoat the herding cattle ritual of Disney. Thanks to this commercial, she was now asking for a trip to Disney with us. On a recent trip to LA, we stepped up and decided that we’d do ONE day at Disneyland but spend the remainder of the week on the beaches of LA. For more details on our LA trip, click here. The least exciting parts of any trip are the logistical transitions, especially with kids. Arriving and departing, shuttles to the hotel or rental car and the endless lines. My Disney World experiences have embodied all the things that were least exciting about travel. Waiting in line for breakfast, waiting in line for a shuttle to the park, herding like cattle to get into the park where we spent the entire day waiting in more lines. 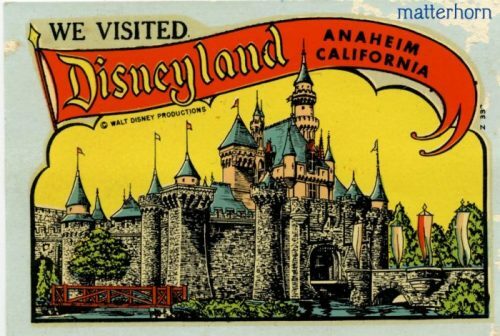 In California, Disneyland is actually comprised of two separate theme parks. There’s the original Disneyland and Disney’s California Adventure Park, they are directly across from each other. Here, each theme park is significantly smaller in size than Orlando’s parks and it proved to be the thing we loved about it. The lines weren’t overwhelming even though we were there during spring break peak season. The longest line we stood in was about 40 minutes and we did it with microbrews in hand and a chatty local couple who made it feel like an afternoon with friends. Walking ten minutes to and from our hotel gave us the freedom to decide how we wanted to spend our time. 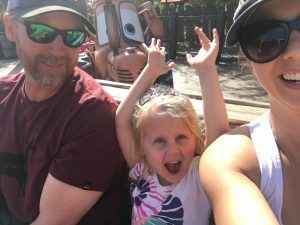 Many people opt to purchase tickets that allow you to visit both parks in one day or choose to do multiple days and will spend a day at each park. That was not us. We stuck to one day only and chose the California theme park for a few reasons. 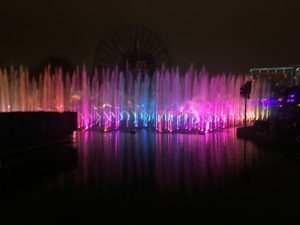 One is many of the rides were unique to this park, the second was the show entertainment included Frozen Live and World of Color. The fact that alcohol is only served in CA Adventure Park might have weighed a little heavier than it probably should, but then again, this was our vacation too and we were picking up the tab. 1.) 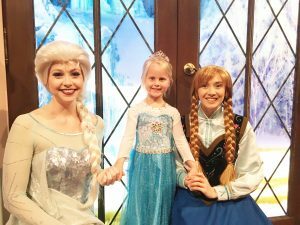 Book your hotel stay on reward points (if you have them) at the Courtyard Marriott Anaheim Disney Theme Park. It’s a ten minute walk from the hotel to the Disney entrance. This hotel is actually a shorter walk distance to the park than it is from the Disney Resort Hotel in the park. There is large waterpark in the courtyard with the pools heated to a warm eighty four degrees and a lovely hot tub. California microbrews and wines were available for purchase in the lobby bistro, there is a Disney gift shop and the rooms are spacious and well appointed with bunk beds. I had a Bob Stroller delivered from City Stroller Rentals to our hotel room the day we checked in and had it picked up the day we checked out. The valet service not only kept the stroller for us, but also pumped up the leaky tire on our rental car before bringing it back to us. For breakfast in the lobby, I enjoyed the Bistro Breakfast Sandwich which had scrambled eggs, applewood-smoked bacon, aged white cheddar, arugula and avocado on a brioche roll. They also offered kid-friendly meals. Audrey was smitten with the french toast, while my husband went for the fruit and yogurt bowl. 2.) Download the Disney App. Purchase your tickets and the additional Max Pass feature directly on the app. It’s $10 more per person, but worth every penny. It’s the ability to reserve a fast pass ticket on your app and to receive all the Disney photos right on your phone. Once we were inside the park, I utilized the Max Pass Feature to reserve our fast passes. We went directly to Radiator Springs Racers, as we were told it is one of the most popular rides. Even though we were at the park at rope drop, it had a 75 minute wait at 8:20 A.M. World of Color Fastpass is not available on the app, but you can pick up actual tickets near the Little Mermaid ride. It basically reserves a roped off area to view the show. We chose the bridge for it’s elevated views and quick exit after the show. The only fastpass I’m now waiting for Disney to create is a fastpass to the restrooms. 3.) Review the Disneyland website and decide on your which rides you want to do and shows you want to attend. Make a list in your notes on your phone to refer to it throughout the day. Be sure to measure your child’s height before you begin your search. You may not hit everything on your list, but it can serve as your guide. 4.) After a full day , return to the hotel by 6pm, grab an adult drink at the Bistro and allow the jets to massage your tired feet in the hot tub while your kids take a turn on the waterslides. Allow enough time for a quick shower and put the kids in their pajamas before heading back to the park for World of Color. You won’t want to miss it. Mark Twain once said “I’m glad I did it, partly because it was well worth it, but chiefly because I shall never have to do it again.” Our little girl had a magical day at Disneyland and it fills my heart to know we were able to give her that. That said, Thank you Disneyland! You are the true original, the best in the business, we will remember you fondly, but we are done now. Not a Superstar? College is still possible! Smarty Alert: Springfree Trampoline Memorial Day Sale through May 28! Set Your DVR’s for Holiday TV!